Can’t Find Time to Exercise? Try These 11 Easy Tips! Can’t find time to exercise? It’s not always easy! But with these 11 sneaky tips, you can get it done and still crush your goals! My husband and I have had the opposite problem since we have known each other and have been working on opposite goals for the past 6 months. He was skinny-fat trying to lose his beer belly and gain weight. I was overweight trying to lose weight. OMG it has been so hard to live with him and still reach my goals! But I’ve had to figure out a few little hacks of my own to fit in some extra calorie burning moves during the day incase I fall off track with the food my husband has been eating (lots of carbs). Can’t Find Time to Exercise? Flex your muscles while standing or sitting. If you’re constantly doing this throughout the day, you’re actually getting some good strength in! Pull in your core, squeeze your booty, flex your thighs and arms… whatever you can sneak in! The best part? No one will even notice! You can do this at work, at the grocery store- wherever. Get rid of the shopping cart and throw things in a shopping bag. If you don’t have a ton of things to buy, carry your stuff around instead of pushing a cart. That is a great workout and has the bonus of saving you some money because you won’t be able to throw extra stuff in a huge cart (hello Target trips) 😉 Just keep a few sturdy shopping bags on hand to do this with. Swap your office chair for a stability ball. 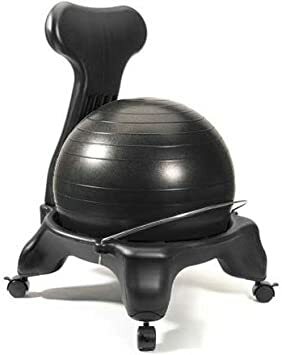 Sitting on a giant exercise ball instead of the typical office chair will cause you to use your core muscles and have better posture all day long. 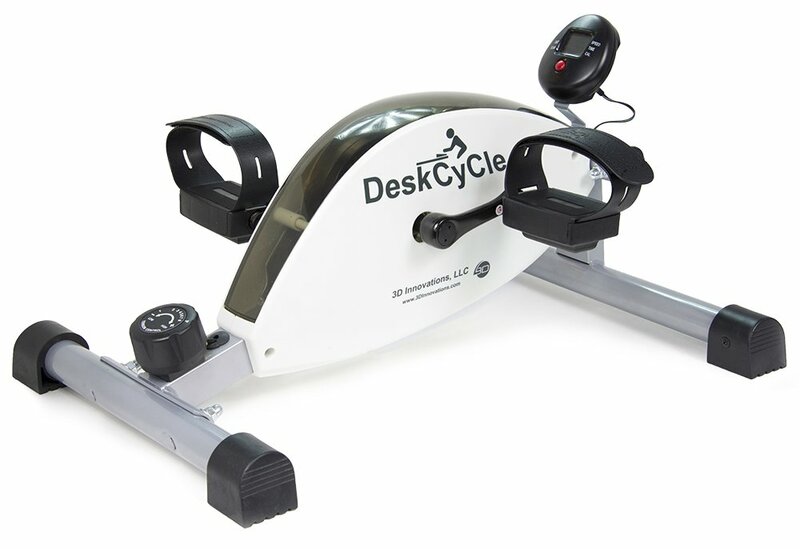 If you sit at a desk all day long and can’t swap your office chair, get an under desk bicycle. They’re inexpensive and will keep you active instead of just sitting around. They also help you stay away and more focused. Speed walk to your errands instead of driving. And if you absolutely have to drive, park somewhere further (like a few blocks down) and speed walk the rest of the way. When you meet with friends, do something active instead of sitting and getting drinks and eating a high calorie dinner. Go to a pool and swim, go to a beach and play volleyball, take a hike somewhere, try a new fitness class together, set up regular gym dates, etc. When you wake up, before you start your regular morning routine, do some gentle stretches or yoga to get you moving and feeling good right away. Then add a 50 crunches and 50 push-ups to the mix. It only takes 10 minutes! Squat while you brush your teeth. Your lower body is where your biggest muscles live, so activating them while you brush your teeth is a great way to keep them strong. Walk your dog’s instead of letting them out in the back. Sometimes just opening the back door is easier… because we’re lazy. But if we take 30 minutes to go for a walk with our dogs (especially multiple times a day) that is a great way to sneak in your needed 30 minutes of activity every single day. Remember, the difference between possible and impossible lies in a persons determination. It is so much easier to not do anything extra and just be lazy, but if you’re determined to crush your goals- it is little things like this that will make all the difference. Do sharks complain about Mondays or exercise? No- they’re up early moving around, biting things, chasing stuff and being scary. Reminding everyone they’re a f*#c$*@g shark. There is no force more powerful than a woman determined to rise, so rise. P.S: You can now subscribe to my YouTube channel or follow me on Instagram for my weekly clean eating recipe & workout videos!